First photo: Chai Cortez of Maui High School, flanked by parents Chris and Shannon, signs her National Letter of Intent to play soccer at the University of Oregon on Wednesday in Kahului. Second photo: King Kekaulike’s Mia Rose Daly (center) poses with her mother, Gina Francesconi, and fellow Na Alii senior Chandler Cowell upon signing with Long Island University Brooklyn, where she will play soccer. 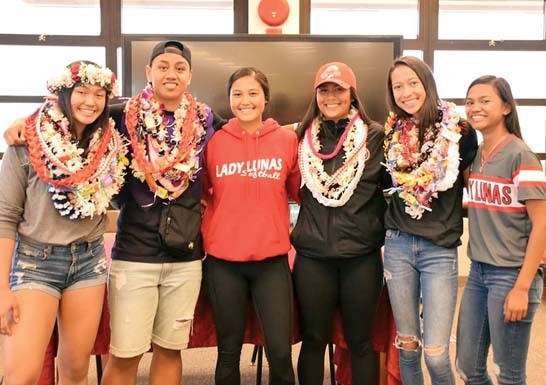 Third photo: Kamehameha Maui soccer player Ilihia Keawekane (left) and volleyball player Aliah Ayau pose together after signing their NLIs on Wednesday. Keawekane is headed to Oregon State while Ayau will attend Puget Sound.